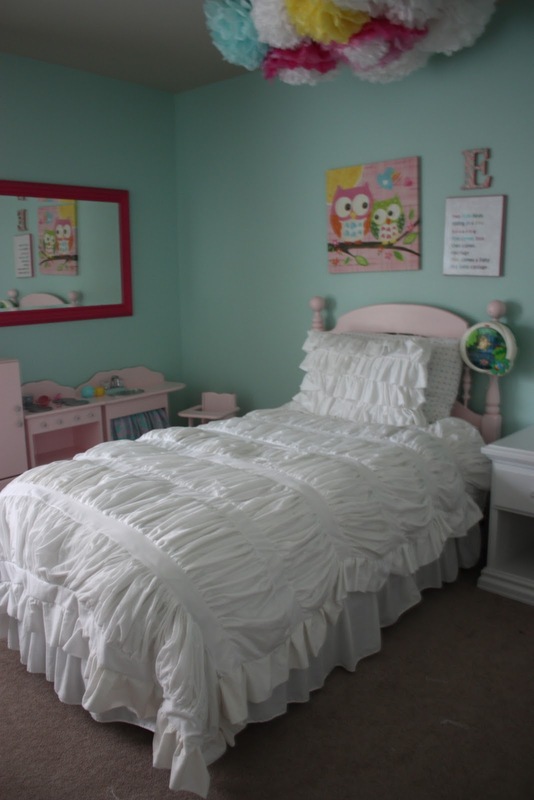 This project was inspired by my cheapness and the Cirrus Duvet from Anthropologie and the Hadley Ruched duvet from Pottery Barn. I started with 2 king size flat sheets from Target. They were $15 each. Plus a twin size white duvet cover which was $19. I could have made my own duvet cover but it involved buttons and measuring and MATH so I bought it instead. 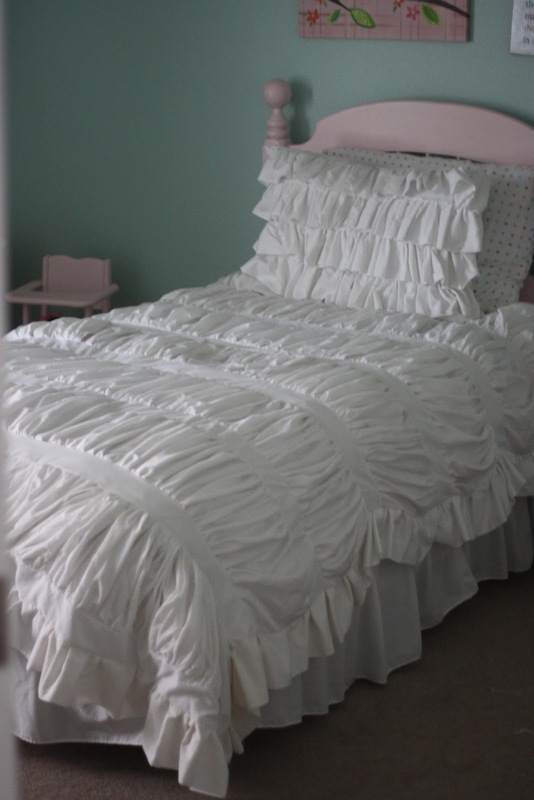 The total cost for the entire adorable, ruffly duvet was $49!! And SO much ruffling and patience. Like 10 hours worth. I spread it out over a couple of weeks so it wasn't so bad. Yes it was bad but so worth it. So here is the basic tutorial with no pictures. I started taking pictures but quit because it takes forever to take a picture and then ruffle and serge and sew. I was afraid that I would die of old age before I had a whole picture tutorial. So you get one picture of my ruffler which I bought from Amazon . I LOVE it. If you just got a ruffler go and watch a bunch of youtube videos on how to use it. I will tell you that almost ALL of my ruffler problems have stemmed from the fact that I forget to put the presser foot DOWN. It's so hard to tell if it's down so if it's getting all messed up CHECK THAT FIRST!! I started by washing and ironing my duvet and two flat sheets. This took at least two TV shows. My husband also volunteered was forced to unpick the two sides and bottom of the duvet while watching football. He's a keeper for sure. 1. 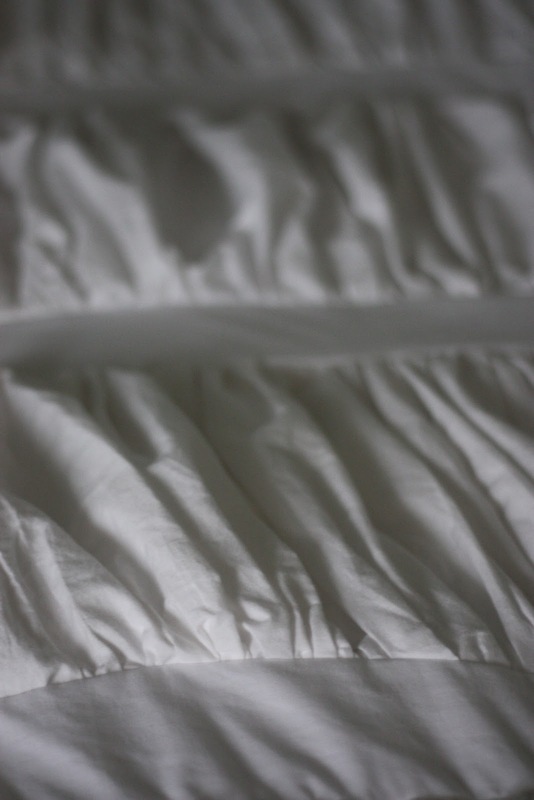 Unpick sides and bottom of duvet. 2. Cut the two flat sheets into 10 inch strips. I needed 14 of the strips. 3. Sew 2 ten inch strips together, I ended up with 7 REALLY long strips. 4. Cut the top of the duvet 3 inches from the top. 5. Cut the duvet top that is now separate from back part, 2 inches of top and buttons into 3 inch strips, I had 7 of the straight strips too. 6. Start ruffling!! I ruffled each end of the 10 inch strips on the "1" setting of my ruffler like in the picture below. This took at least 6 talks on TED.com. So I am now smarter and have ruffles. 7. Pin and then sew straight 3 inch strips to the ruffled 10 inch strips. 8. 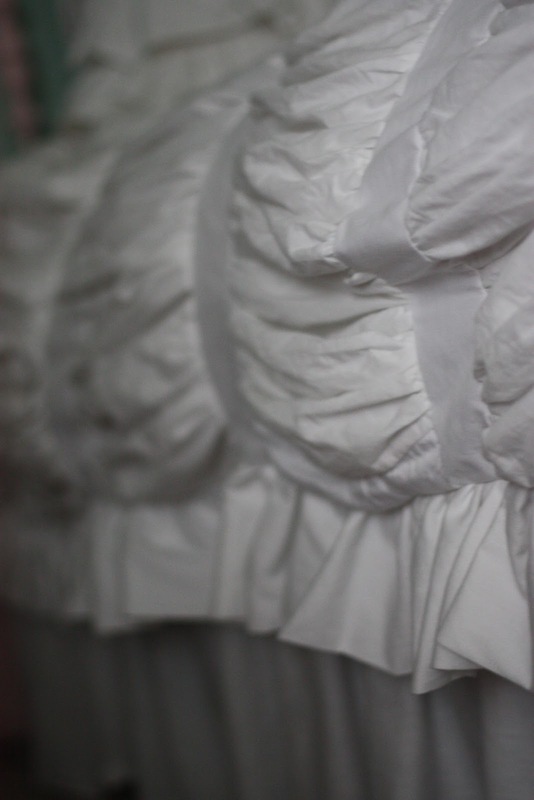 Once all your ruffles are attached to straight pieces pin the ruffled part back onto the duvet really carefully and then sew it all back together. 9. I cut some extra 10 inch strips and then folded them in half and ruffled them and added them to the edges as another little ruffling touch. It also helped hide any mistakes that I totally made after throwing perfection out the window. 10. Write yourself a letter reminding yourself never to start another project involving so many ruffles. 11. Put completed duvet on your 2 year olds bed. Have her run in all excited after lunch and smear her ketchup covered face into new duvet. Ruffler with 1 setting. All done!! Love it. I made the ruffly pillow too with some leftover 5 inch strips from the edging. Knock off decor has a great tutorial on how to make the pillow. 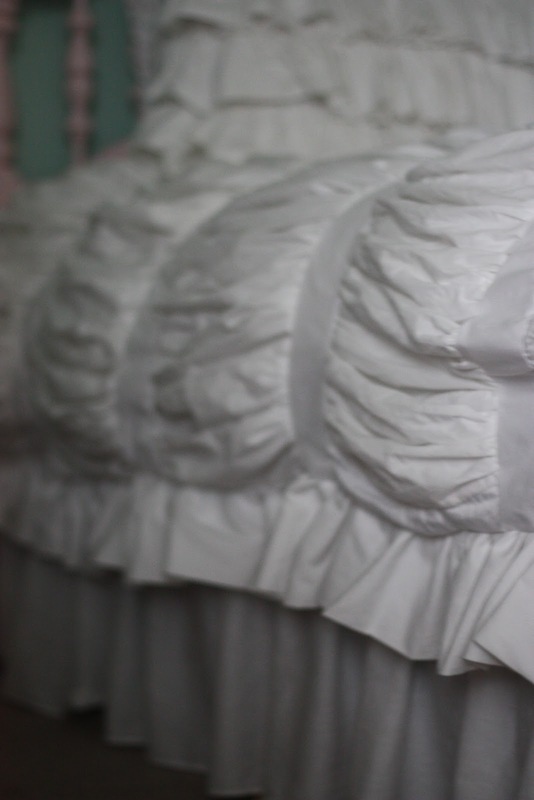 Lots and lots and lots of ruffles!